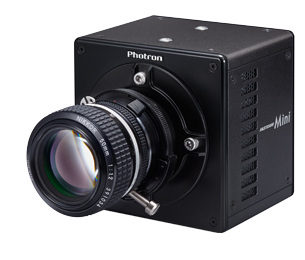 The Photron FASTCAM Mini UX100 high speed camera packs a lot of performance in such a small package, providing 1,280 by 1,024 pixel resolution to 4,000 frames per second (fps) and reduced resolution operation all the way to 800,000 fps, with 1,280(H) by 720 (V), equivalent to 720 HD video resolution, to 6,400 fps. This makes the UX100 a small and lightweight camera ideally suited for applications as varied as fluidics, life sciences or ballistic testing. A global shutter provides blur free imagery with a minimum shutter speed of 1µs with 12-bit pixel depth (36-bit for the color version) from the CMOS pixels 10µm square pixel providing an ISO 12232 Ssat certified light sensitivity of 10,000 ISO for the monochrome version.